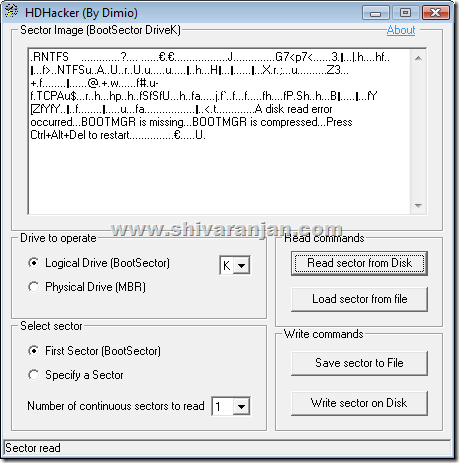 HD Hacker is free small utility using which you can backup and restore the MBR sector of your hard disk drive quickly and easily. The master boot record (MBR) of your hard disk drive is very important as without it computer won’t boot up. The master boot record can get corrupted due viruses and at certain times if you try to dual boot your hard disk drive incorrectly. In addition to backup and restore functions the HD Hacker allows you to visualize the master boot sector (MBR) of the hard disk drive. To backup the master boot record (MBR) run the software and select the “Read sector from Disk” button the software will now read master boot record (MBR) and display it. Now hit the “Save sector to file” to save master boot record (MBR) information to a file. To restore the master boot record (MBR) select “Load sector from file” button and point it to the restore file that you created earlier. This will now load the data from the file and also display the master boot record (MBR) that would now be restored. Now select the “Write sector on Disk” option to write master boot record (MBR) contained in the file to physically write it to the hard disk drive. HD Hacker can also read the boot sector of the logical drives and it allows you to read data from a particular sector of the hard disk drive. HD Hacker does not require any installation and hence can be run from a portable drive as it only weighs under 35 KB. We tested this software in Windows XP and Windows Vista.